The Dakshina Kannada Lok Sabha constituency, held by the BJP, wants a lot of issues resolved, including jobs and a bank merger seen as an assault on local pride. Mangaluru: If there is any Lok Sabha constituency in Karnataka where the anti-incumbency factor should work against the Bharatiya Janata Party (BJP), it is Dakshina Kannada. In this light, Prime Minister Narendra Modi’s visit to Mangaluru Saturday and the euphoria it generated may have come as a relief for the party. Not that Modi came up with any quick-fix solutions. Save the repetition of a five-year-old, yet-undelivered promise of setting up a separate ministry for fisheries, he hardly touched upon any problem intrinsic to the constituency. His failure to mention the local fishermen who have been missing off Goa since December 2018 only accentuated the peculiar poll-campaign pattern in the 2019 Lok Sabha elections. People are betting big on Modi, despite deep dissatisfaction with the incumbent MP, Nalin Kumar Kateel, who is also the BJP candidate for 2019. Will such a vote of confidence pay off? There is no dearth of issues in Dakshin Kannada. The constituency has been clamouring for a separate ministry of fisheries for a long time, and Modi had no explanation on his visit for why it has not been done so far. This insensitivity to local sentiment rankles some. “He did not acknowledge the families of the missing fishermen… The fishermen do not trust him,” Ivan D’Souza, parliamentary secretary to Karnataka Chief Minister H.D. Kumaraswamy, was quoted as saying Saturday. Among the issues Modi skirted on his visit is the local resentment over the recent merger of the profit-making Vijaya Bank, which has its roots here along with a host of other banks, with the loss-making Bank of Baroda and Dena Bank. Instead, the Prime Minister indulged in mud-slinging, blaming the Congress for the crisis in India’s banking sector. The Dakshina Kannada Lok Sabha constituency, known as the cradle of banking in India, has seen the birth of four major banks — Vijaya Bank, Syndicate Bank, Corporation Bank and Canara Bank — in the Mangaluru and Udupi districts. It was the local Bunt community that founded the Vijaya Bank in 1931. Mulki Sunder Ram Shetty, a member of the powerful community, was singularly credited with the growth of Vijaya Bank from 1946. In the days following the nationalisation of banks in the Indira Gandhi era, thousands of families in this region had at least one member working in these banks. Modi chose to forget that his own government paved the way for the merger, which took effect 1 April and is seen locally as a failure of MP Kateel, who is also a Bunt. Over the last few months, Kateel and the BJP have come under attack for failing to prevent the merger and there have been a series of protests. 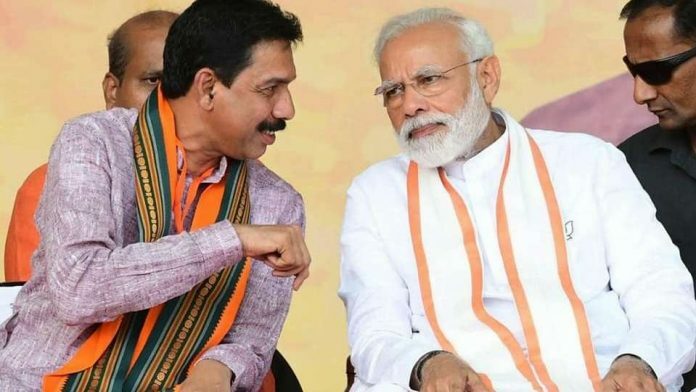 Hours before he arrived in Mangaluru, the Congress was all set to raise “Go Back Modi” slogans on this very issue, but was denied permission for the protest by the district authorities. The issue will continue to remain alive, at least till the elections are over. If the Congress accuses the BJP of a conspiracy of silence over the merger, the BJP retorts that the merger process began when the Congress was in office at the Centre. Many retired executives of the bank have also lashed out at the BJP for not speaking up against the merger. “Vijaya Bank had helped the BJP and the RSS grow but they did not attempt to prevent its merger,” said Subbaiah Shetty, a former managing director of the bank, at a press conference last week. Kumaraswamy, the Chief Minister and Janata Dal (Secular) leader, said the Bunt community should question the prime minister for disrespecting Sunder Ram Shetty by subsuming the identity of Vijaya Bank into that of another bank. “What did Kateel do to prevent this merger?” he asked in Mangaluru earlier this month. When questioned about the merger, Kateel trained guns on the Congress, pointing out that local Congress leaders like M. Veerappa Moily didn’t oppose the proposal when it was first moved in the United Progressive Alliance (UPA) government. Several other issues trouble locals as well. For example, every single day for nearly a decade, Mangaloreans have been crawling past the 900-metre incomplete Pumpwell Flyover, which stands testimony to Kateel’s poor showing. The flyover was meant to ease intercity and highway vehicular movement, and its construction involved the shifting of a 26-foot-Jain Kalasha (cupola) from the Mahaveer Circle, another object of emotional connect for locals. Inadequate job creation and the return of locals from the Gulf is also an issue that resonates with locals. The proliferation of sugarcane juice vendors across Bantwal, Mangaluru, Moodbidri and Surathkal, and mobile phone shops surfacing all around, are indicative of the job crisis. “They are not making money but have no other choice,” Muneer Katipalla, a Communist Party of India (Marxist) leader, told ThePrint. Kateel has also failed to champion the cause of under-paid workers in the 150-year-old tile industry as well as the beedi units that dot this seaside city. No wonder, as in many constituencies across the country, the BJP is making no bones about seeking votes in the name of Modi here too. Before Kateel’s candidature was decided upon, the chorus in the local BJP was “Modi OK, Kateel yaake (Modi fine, but why Kateel)”. With BJP supporters willing to brush issue after issue under the carpet, Kateel may still sail through the third time, thanks to the “Mathomme Modi (Modi again)” campaign. In his defence, Kateel has been harping on the effective use of the MP local area development funds. “I will win by a margin of over two lakh votes,” he was quoted as saying in an interview earlier this month, citing the sanction of initiatives worth over Rs 16,500 crore, including the smart city project, a plastic park, fishing harbour and grants for the development of the Mangaluru airport.